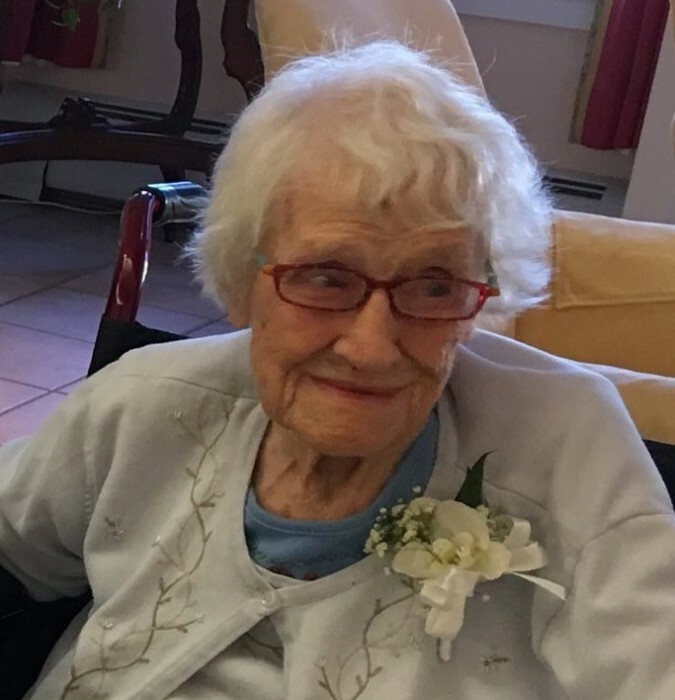 York, Maine - Ruth M. (Seddon) Santoro passed away peacefully, February 9, 2019 at the age of 102. She was a resident of Sentry Hill in York, ME at the time of her death. Born in Providence, R.I. on May 12, 1916, she was the daughter of the late Jesse and Charlotte (Crossley) Seddon. Ruth is survived by her son, Richard and his wife Martha of York, ME; her grandchildren, Gary and wife, Tasha, of Warner Robins, GA, Paul of Kittery, ME, Jerilyn (Santoro) Coffie and her husband Robert, of DeBarry, FL, Kimberly (Santoro) Luna and her husband, Robinson, of DeLand, Fl; great grandchildren Ashley, Travis, Blaze and Makayla; many nieces and nephews. Ruth was predeceased by her husband, Armand "Jake" Santoro, who died in 1982, and son Kenneth Santoro who died in 2018, as well as five brothers and sisters, Mildred, Gertrude, Jesse, Raymond and John. Ruth was devoted to her family and took great pride in their accomplishments. After moving to Norton, MA with her family, she worked for many years at the Fuller Box Company in Norton. She was known to her family as a great cook and enjoyed handcrafting many gifts for her family. She loved knitting, crocheting, needlepoint and pottery. Ruth’s family wishes to thank the staff at Sentry Hill, Durgin Pines and Beacon Hospice for the loving care she received in her final days. A Celebration of Life service will be held at 11:00 am on March 9th in St. George’s Episcopal Church, York Harbor, Maine with a reception following the service. Donations in Ruth’s honor can be made to a charitable organization of the donor’s choice. Burial will be held at a later date in Norton, MA. Lucas & Eaton Funeral Home, York Maine is assisting with arrangements. Visit www.lucaseatonfuneralhome.com for online condolences.